This is a series of Questions & Responses based on inquiries I often receive from readers of my blog. The questions and responses are directed to the middle of the conservative Christian church. You may find it helpful to share these videos with friends and family that are not accepting or affirming. I wish I had had this information ten years ago; it would have answered so many of my questions. It is my hope that this series will bring understanding in an arena where there is an abundance of myth and misinformation. 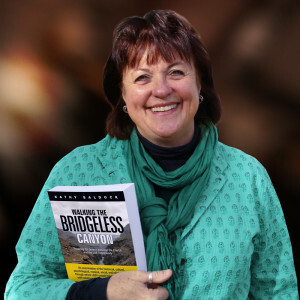 If you have any questions you would like me to answer, please send them to: kathy@canyonwalkerconnections.com Serious questions will be considered. 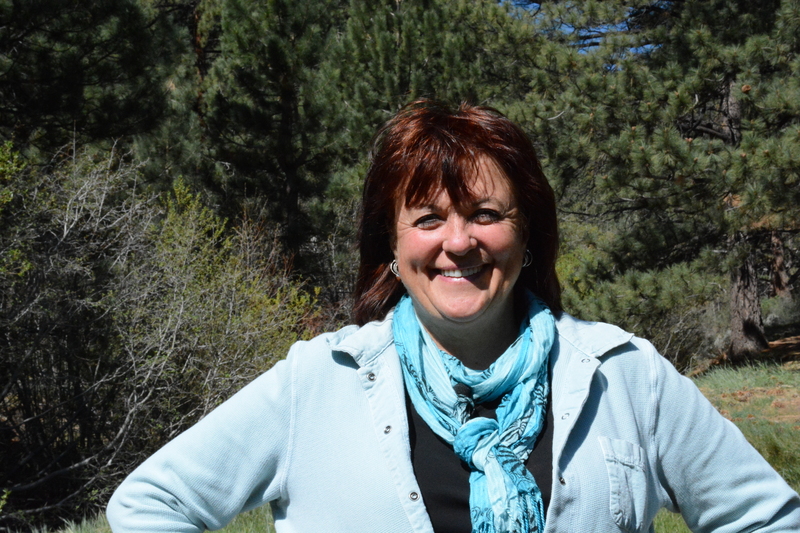 Thanks for watching, now come along on the trails with me (and my dogs!). Get a copy, give a copy. 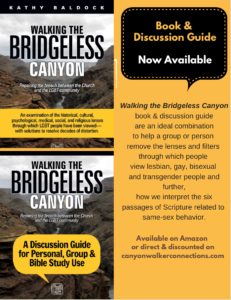 #1: Your ministry, Canyonwalker Connections, is geared towards engagement, encouragement and education between the lesbian, gay, bisexual and transgender Christian community and the conservative Christian church. Can you tell us how this ministry came to be and where you see it going. #2: You have been a Christian for three decades. Most of those within the evangelical church who still see homosexuality as as sin. As an evangelical Christian, what brought you to the place of no longer viewing homosexuality as a sin? 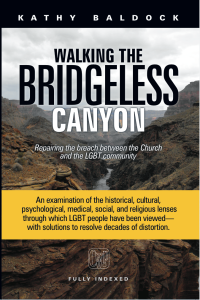 #3: What are the cultural issues that the church must contend with to engage more effectively with the lesbian, gay, bisexual and transgender community? #4: You believe that homosexuality is not a sin, aren’t you neglecting so many scriptures in the Bible that appear to be against homosexuality? How would you respond to those that say you are hindering more than helping the lesbian, gay, bisexual and transgender community by not calling sin for what it is and speaking the truth to them in love about their problem? 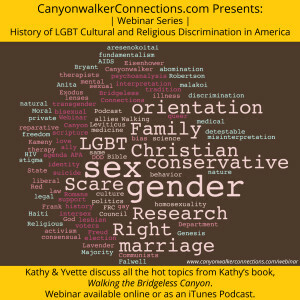 #5: What are some of the critical problem areas in the church’s relationship to the lesbian, gay, bisexual and transgender community? #6: Arguments are made that gay activism is threatening freedom of speech, freedom of religion and religious liberties in general. How do you respond to this statements? 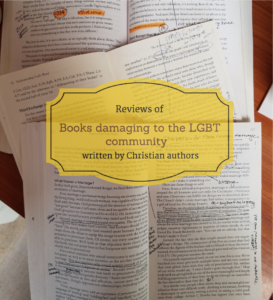 #7: Have you seen many individuals from the evangelical community like yourself change their perspectives concerning homosexuality as a sin? How have they come to that new understanding and are you seeing a shift within the conservative church? Part One of Two: At Lighthouse of Hope Christian Fellowship, Vancouver, BC. Moderated by my Board member and “sister” Lisa Salazar, a transwoman Christian. This video will give you insights as to who I am, the journey I have taken from tolerant to accepting to ally to advocate. I am no one special; I am just willing to listen to the Holy Spirit and respond. Lisa asks great questions and the insights will be helpful to anyone trying to step into this difficult conversation of inclusion of gay, lesbian, bisexual and transgender Christians in the church. Part Two of Two: At Lighthouse of Hope Christian Fellowship, Vancouver, BC. Moderated by my Board member and “sister” Lisa Salazar, a transwoman Christian. This video will give you insights as to who I am, the journey I have taken from tolerant to accepting to ally to advocate. 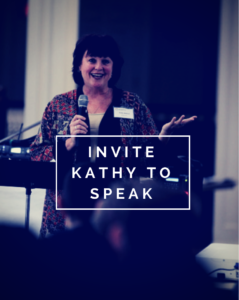 I am no one special; I am just willing to listen to the Holy Spirit and respond.